Kammy's Korner: How 'bout a House Before and After? How 'bout a House Before and After? If anyone has vision, my parent's have it. Not sure I could have envisioned what this could be, but I'm thankful they did! They bought this house just outside of Cedar Falls, IA when I was 12 years old if I remember right. See those three windows on the left? That would be where the master bedroom now sits. Man, it was downright ugggggly. Yes, this house is one and the same! I think it's changed a little from when I took this pic a few summers ago since hail damage smacked it a good one last summer! (And it must be an old pic since that would be my beautiful super charged Grand Prix GTP in the driveway. sniffle, sniffle... on to mini vans....) Pretty sure the shingles are a dark brown. Now I'm not an observant person, especially with things like the color of a shingle! 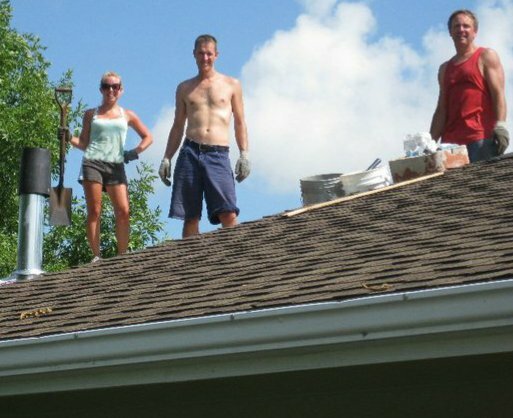 HOWEVER, when you're helping do the shingling, you can't help but notice. It was a heat index of over 100 degrees when I was up there workin' my booty off with Dad and the hubby. Okay, okay, so I didn't put more than a day or two in, but it was enough to make me sore enough that I could hardly walk!! Anyone want to put a girl's roofing team together? You get paid for your workout and a good tan. That is amazing! How long did it take them? Do you loan them out? lol I have had to shingle 2 houses before (well, not the whole thing and not by myself) and each time I have said I will never do it again. I can't carry more than 2 or 3 shingles up a ladder by myself. Kudos to anyone who can carry a whole bundle of shingles up a ladder. Hahahaha I'm always joking about girl demolition! Auto detailing/whate ver crews. Once you get past the heat roofing can be fun. I did it 5 days a week for an entire summer! As long as ur constructing the roof and not tearing it apart. Then ur jus dirty and theres no way around countin the hours till Lazy-boy time haha. Brett - yeah, unfortunately, we were tearing off. Wowzers. dirty! But....... I've always said I prefer to EARN my showers! haha. I bet you some ripped action going on that summer. Marti - they hired most of the work done... quite a few months though before it was done? 6 maybe? Adrienne - you live nearby? Let's do it!